How about THIS line-up, WQED’s Rick Sebak, Mancini’s Bread and a comedian Gregory Joseph? On top of that, John Knight says he’s going to Hell? We were back in the studio with guest co-host Rachel Carlson of Yelp Pittsburgh talking about bread, kids, April Fools stories and Rick’s new Kickstarter called….wait forit…… RickStarter! If you don’t see the player bar above, click the one below to listen while you goof off and pretend that your working! has the new No Wait app! Get in line at your fav restaurant VIRTUALLY! Also…make sure you vote on the YaJagoff.com March Madness Brackets for the “Things That Turn People Into Jagoffs” March Madness Tournament! Episode Music: Johnny Angel and the Halos band. Don’t miss their upcoming 50th Anniversary Show on April 8th. 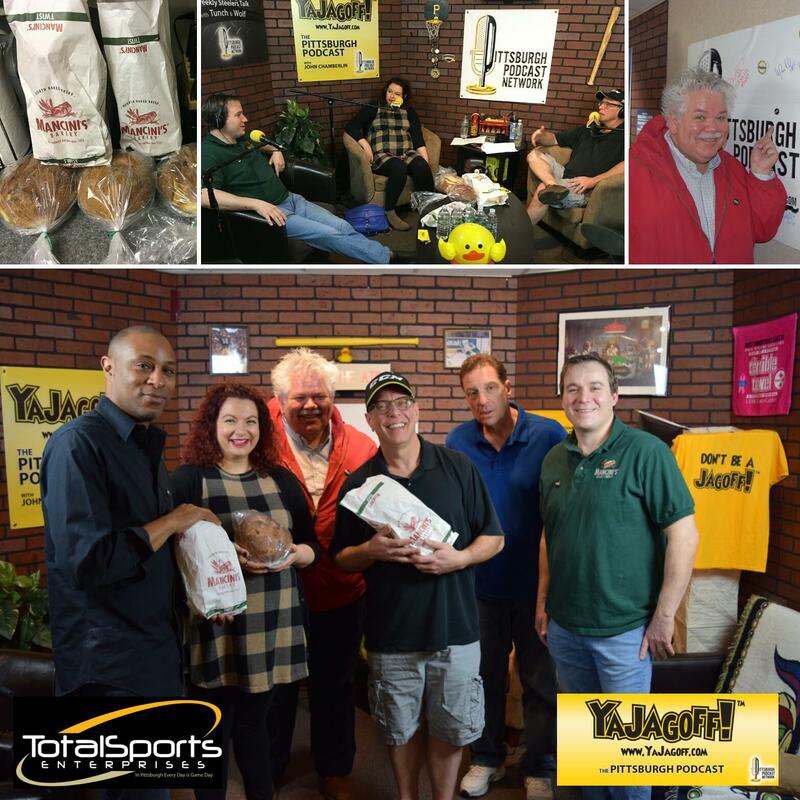 05:02 John Knight, who writes the “What Aggravates Me” blogs every Saturday on YaJagoff.com stopped in… pretty sure he only stopped in because he could smell the Fresh Mancini Bread! 11:38 Rick Sebak, you know, “Mr. Pittsburgh,” is here. First, he brought donuts from Just Good Donuts! If he wasn’t a best friend of everyone on the podcast before that, he is now! Second, he and WQED have a Kickstarter shooting more Pittsburgh vidoes. The project is called, “Nebby” and, check THIS out… you can donate at… RickStarter.org ! And what’s his April Fools story? 35:01 Nick Mancini Hartner brought us warm Italian bread AND Easter Paska bread! Mancini’s Bakery has been baking bread since 1926. The bakery continues to grow and have lines, every Sunday, of people wanting their warm bread for Sunday Dinner. 47:55 Comedian Gregory Joseph stopped in. We filled him full of donuts and bread so that he’ll come back. April Fool’s Day is his day off! It’s the day for the amateurs to shine! Make sure you follow him and go see his Pittsburgh shows this month! 60:52 Ok… see yinz all at the Atria’s PNC Park on Friday, April 7th, 11-noon on the patio just before the home opener.